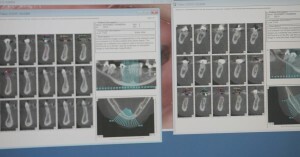 Dental implants are changing the way people live. They are designed to provide a foundation for replacement teeth that look, feel, and function like natural teeth. The person who has lost teeth regains the ability to eat virtually anything. Patients with dental implants can smile with confidence given that surgical and dental laboratory advances have allowed us to virtually duplicate the cosmetic appearance of natural teeth. The implants are small titanium and/or zirconium cylinders that are surgically placed into the jawbone where teeth are missing. These implants act as root substitutes. The bone bonds with the titanium/zirconium, creating a strong foundation onto which artificial teeth can be secured. Small posts called abutments that protrude through the gums are then attached to the dental implant. These abutments provide stable supports for the artificial replacement teeth. Implants are a team effort between an oral and maxillofacial surgeon and a restorative dentist. While Crescent performs the actual implant surgery, initial tooth extractions and bone grafting if necessary, the restorative dentist (your dentist) fits and makes the permanent prosthesis. Your dentist will also make any temporary prosthesis needed during the implant process although this service can also be provided by our clinic. A single prosthesis (crown) is used to replace one missing tooth – each prosthetic tooth attaches to its own implant. A partial prosthesis (fixed bridge) can replace two or more teeth and may require only two or three implants. A complete dental prosthesis replaces all the teeth in your upper or lower jaw. The number of implants varies depending upon which type of complete prosthesis (removable or fixed) is recommended. A removable prosthesis (over denture) attaches to a bar or ball in socket attachments, whereas a fixed prosthesis is permanent and removable only by the dentist. Crescent Oral Surgery performs in-office implant surgery in hospital-style operating suites, thus optimizing the level of sterility. Hospital implant surgery is for patients who have special medical or anesthetic needs or for those who need extensive bone grafting. A Swedish scientist and orthopedic surgeon, Dr. Per-Ingvar Branemark, developed this concept for oral rehabilitation more than 45 years ago. With his pioneering research, Dr. Branemark opened the door to a lifetime of renewed comfort and self-confidence for millions of individuals facing the frustration and embarrassment of tooth loss. In most situations, dental implants have a 98% success rate. There are several reasons. Teeth have been replaced for thousands of years with bridges utilizing the adjacent teeth to support the artificial/missing teeth. This requires removal of natural enamel on the adjacent teeth. Why sacrifice the structure of surrounding good teeth to bridge a space? In addition, removing a denture or a “partial” at night may be inconvenient, not to mention that dentures that slip can be uncomfortable and rather embarrassing. Planning your treatment is essential for successful outcome. In most cases, an initial consultation takes place with one of our surgeons who will review your medical history and perform both a clinical and radiographic (x-ray) exam. In certain situations, additional X-rays called a CBCT scan is required to determine if you have enough bone volume within your jaw to support the dental implant. At times, either bone or gingival (gum) grafting is required in order to provide you with a predictable result. Anesthetic options are discussed at the consultation visit. Many factors determine what type of anesthetic is suggested for your specific situation. This will depend on your level of anxiety with dental procedures as well as the complexity and length of your treatment. In all cases, local anesthesia is used but, in addition to that, patients may undergo their treatment under light or deep sedation as well as general anesthesia. Ensuring a comfortable experience for our patients is our priority and one of our oral surgeons will guide you through the process of determining what type of anesthesia is right for you. Once the implants are in place and restored with teeth, they will serve you well for many years if you take care of them and keep your mouth healthy. This means taking the time to practice good oral hygiene (brushing and flossing) and keeping regular appointments with your dental specialists.